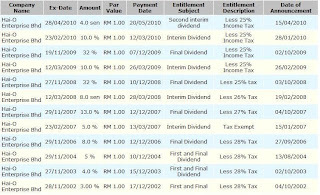 From dividend historical, HAIO will announce their dividend around end of Sept OR early Oct. 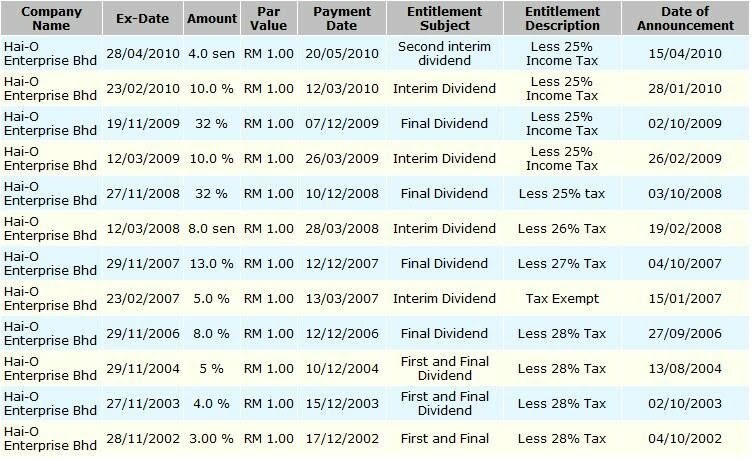 However, HAIO has been 1 step early proposed 14.5cent dividend (Final Dividend of 10 sen, less tax and a single tier dividend of 4.5 sen) as their final dividend of FY 30 April 2010 on their website. 4. Dividend Policy: The group has raised its commitment to reward shareholders by establishing a minimum dividend payout policy of 50% of net profit. Let watch closely, do not miss the opportunity! Pls buy at your own risk & consult your broker b4 make any buy or sell order!! !